Marriott wanted to soften the blow by the end of this card and this is a great way for the card to go out. Cheers to Marriott and Chase for doing this with some grace. And stay tuned for some more news tomorrow for Chase cardholders! Wyndham Hotels announced they are buying La Quinta Hotels. The U.S. based chain has a very small presence in Canada with only 2 hotels but does have almost 900 hotels in the U.S. and Latin America. Of note for most Canadian is the La Quinta Returns program will be absorbed into Wyndham Rewards which means you 'll be able to use the latter to redeem for stays at La Quinta Hotels once the sale is approved and the programs are integrated. 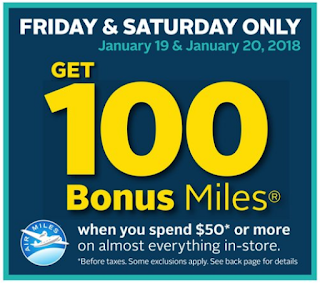 Receive 100 bonus AIR MILES Reward miles when you spend $50 or more at Rexall today or tomorrow! Or go shop at Shoppers Drug Mart tomorrow to earn 20X Shoppers Optimum Points when you spend $50 or more. 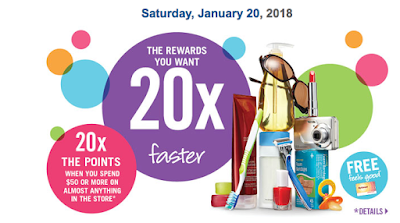 Remember right now is the time you want to rack up as many Shoppers Optimum Points as come February 1st your points will convert to the new PC Optimum program and the more points you have the more value you'll get for them. Read more about that here.